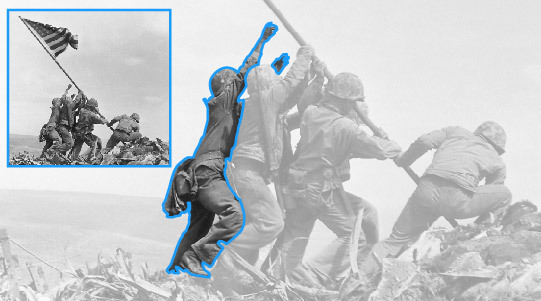 His image, as one of six U.S. Marines photographed raising the U.S. flag over Iwo Jima’s Mount Suribachi near the end of World War II has been reproduced millions of times. The name is widely recognized. There are books, movies and even songs, including Johnny Cash’s hit, “The Ballad of Ira Hayes.” He was hailed as a hero. Ira Hamilton Hayes was born in Sacaton, Arizona on January 12, 1923 on the Gila River Indian Reservation. Ira was a Pima, the son of Nancy and Jobe Hayes. Nine months after the Japanese bombed Pearl Harbor, Ira enlisted in the Marine Corps. He was 19. Before he left, his community held a traditional Pima ceremony for him. His parents wanted him to remain home, but he wanted to go, wanted to help defend the U.S. and protect his family. He was proud to be a Marine and retained that pride throughout his life. After completing boot camp he was accepted into parachute training, something reserved for only the best young Marines. He was proud to be the first Pima to receive Marine Paratrooper wings. His fellow Marines nicknamed him Chief Falling Cloud. On the fourth day of horrific fighting on Iwo Jima, February 23, 1945, four Marines reached the top of Mount Suribachi; later that same day a larger group returned and erected a U.S. flag around noon. Later that afternoon, it was replaced with a larger flag. Hayes was one of the Marines raising that larger flag. A month later, President Roosevelt ordered that the men in Rosenthal’s photo immediately be returned to the U.S. and tour the country as, he said, “immortal heroes” to inspire all Americans. Hayes had not yet been identified in the photo, and he tried to hide his identity, not wanting to leave his buddies, who were still in the midst of a bloody battle. 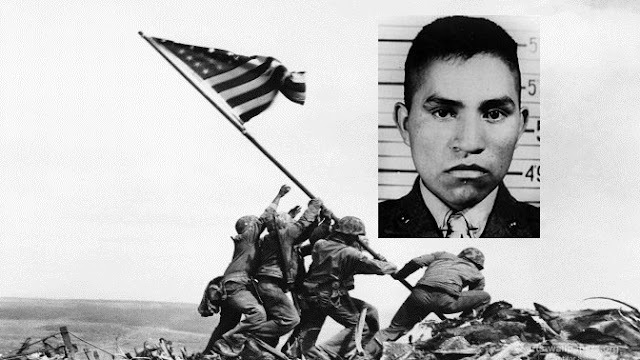 People recognizing him would often ask for stories from the “Iwo Jima hero,” but it wasn’t in his culture to seek recognition, and he hated the phrase. Hayes was found dead on January 24, 1955. A hero’s life was cut short, 10 years after raising the flag over Iwo Jima. 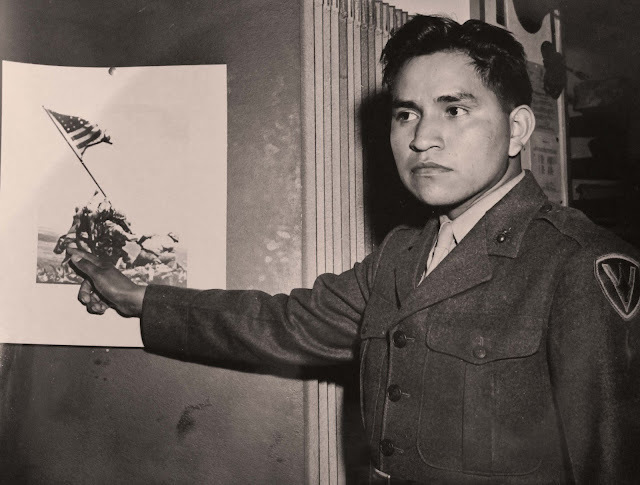 Responses to "Immortal Hero: The story of Ira Hayes, a Pima Native, who refused recognition"
My favorite Uncle Charles Harding was a Marine and was there on Iwo Jima at the same time as Ira Hayes, they were both always my heroes, may they both Rest In Peace!!! My step dad was there in the Marine Corp. He received a Purple Heart. our sacred land and waters of Turtle Island. The Pima blanket he always wore, folded at the back of his belt, is visible in the photograph. [ He is at the far left. ] The blanket was not included in the Iwo Jima Monument in Washington.